Research and education regarding labour history is one of our areas of activity. The aim is to stimulate research on labour movement and employment, focusing both on history and topical issues. For this purpose, we publish the journal Arbetarhistoria, have a research council, collaborate with Swedish and foreign universities and other research institutions, organize conferences and seminars, and initiate, participate in or publish our own publications. As an institution, as well as individual employees at the institute, are members of the various committees and cooperation bodies which organize planning meetings, seminars, conferences and publishes papers, often with a clear research focus. We assist in the supervision of students and graduate students, arrange group tours and collaborates with organizations and institutions in order to increase interest in the work and labour history. Our employees also participate in ongoing research. 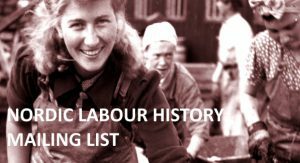 This Nordic Labour History Mailing List is intended for collaboration of historians within the field. Please feel free to share research ideas and questions as well as papers. The aim is to increase collaborations. You have to be a member to either post or take part of previous posts on the list. Send an email to: nordic-labour-history-request [a] lists.sunet.se with subject “subscribe”. You are now a member of the list. To see the collection of prior postings to the list, visit the Nordic-labour-history Archives. Don’t forget to reply and confirm your subscription. If not a member, your mail will not reach the list.